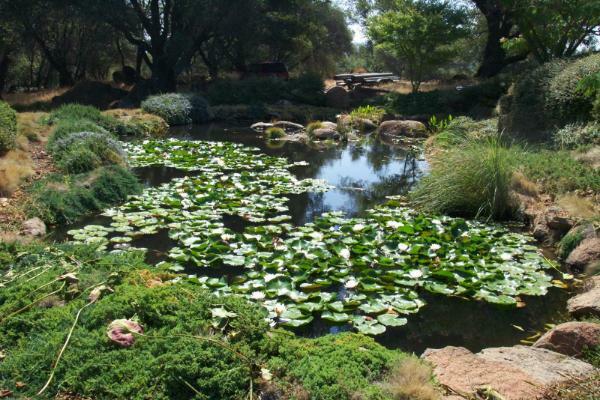 Healthy pond ecosystems help conserve water, reduce carbon dioxide, produce oxygen, provide enjoyment and raise property value. Three living groups form the basis of every ecosystem: producers (autotrophs), consumers (heterotrophs), and decomposers (saprotrophs). Producers include phytoplankton, plants (such as algae), bacteria and protozoa. These organisms convert carbon dioxide and sunlight into organic compounds that consumers can utilize. Consumers, which include zooplankton, insects, worms, snails, amphibians and fish, survive by feeding on consumers and the nutrients they produce. Bacteria and fungi form the third and final link of the cycle, recycling waste produced by consumers into components that producers can use. 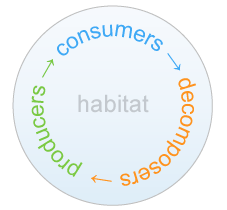 Habitat (a combination of many physical factors and conditions) determines the success or failure of an ecosystem. A properly constructed pond will include habitat features designed to encourage a healthy ecosystem. The result is a lower maintenance, more natural pond. At Thunder Mountain we apply our environmental expertise and industrial liner know-how to every pond or liner that we design and install. Whether you are looking for a three acre industrial wastewater pond or a 1,000 square foot ranch pond, a Thunder Mountain expert can help.